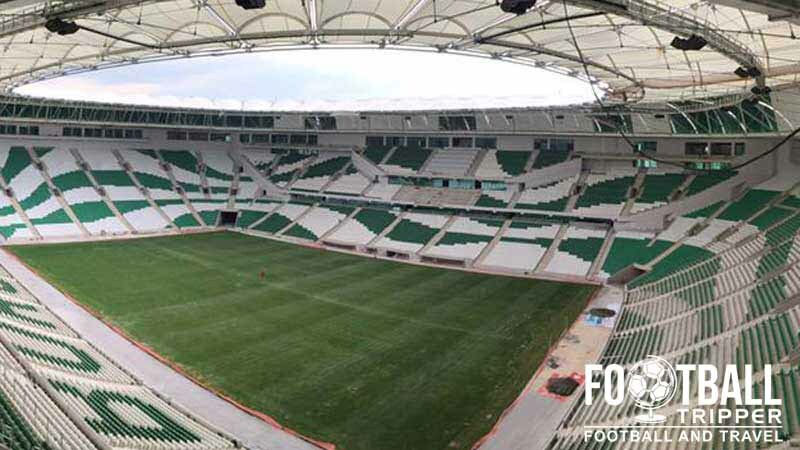 Timsah Arena or The Crocodile Arena is the name of Bursaspor’s brand new stadium which is scheduled to open during the 2015/2016 football season. Inspired by the club’s nickname “The Green Crocodiles”, the football ground features a green exterior based on a croc’s body and head. 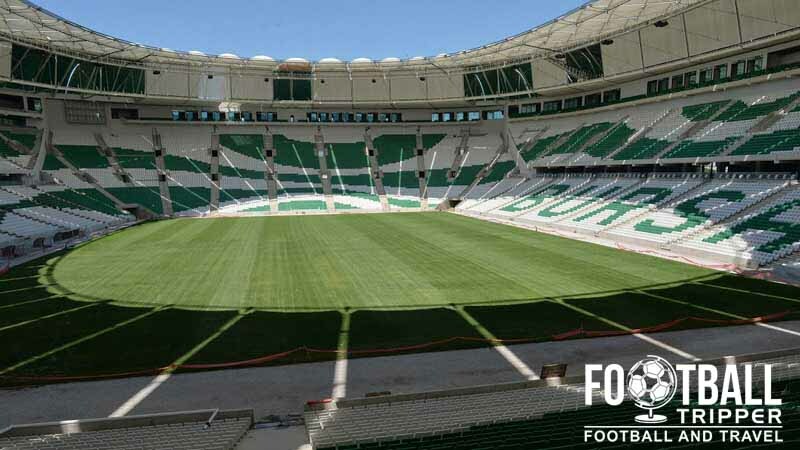 Before moving to the Timsah Arena Bursaspor played their home matches at Bursa Atatürk Stadium which first opened in 1979, although the site’s ground’s use for various sports dates as far back as the 1930s. Capable of seating just over 25,000 the legacy of hosting athletics meant that the ground was oval shaped, and the stands set back from the pitch. When Bursasport were crowned unexpected Winners of the Turkish Super Lig during the 2009/2010 season the club automatically qualified for the Champions League. The old Atatürk ground immediately required renovation work to satisfy UEFA’s stadium criteria, and thus a long term solution was sought. Plans for the ambitious Timsah Arena were publicly revealed on 10th July 2009 to a mixed reception. 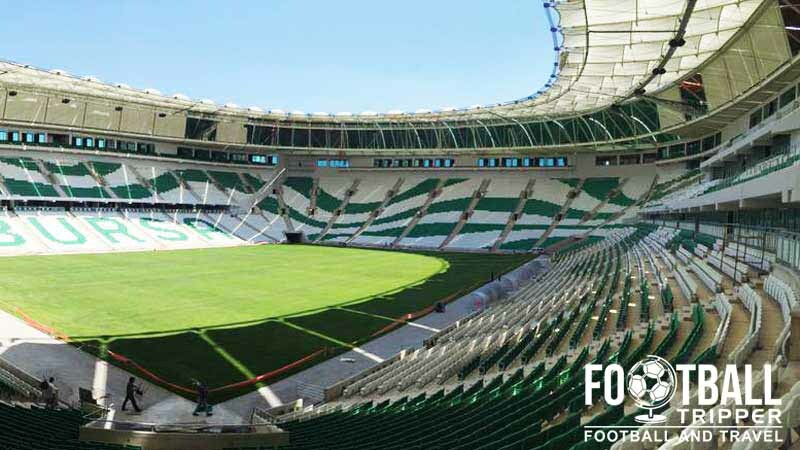 With numerous CGI renders consantly doing the rounds on the internet many assumed that Bursaspor’s new stadium project was brilliant but unrealistic. Nevertheless construction work began just under two years later on 1st June 2011. By the Summer of 2015 the Timsah Arena began to shape up with the pitch laid and the seating installed. 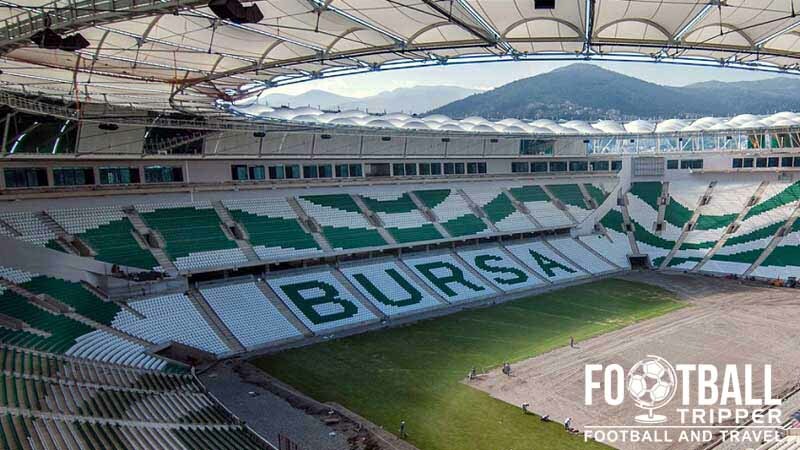 With the Crocodile’s head and green exterior cladding currently being added it won’t be long until Bursa’s new stadium officially opens during. We will add a seating plan as soon as there’s one available on the web. Click the thumbnails to enlarge each image. Information to be added as soon as Timsah Arena opens. Gatorade sales points are yet to be confirmed. Information coming as soon as it opens. It would be a crime against humanity if football fans around the world aren’t given the opportunity to undertake stadium tour into the belly of the beast. We will let you know how you can snap up tickets as soon as the information is public ally released. Timsah Arena is situated around 5.9 km north-west of Bursa’s city centre between the eastern bank of the Nilüfer Çayı (river) and the southern side of the E881 motorway. Upon completion of the first phase there will be a two-storey car park capable of accommodating an estimated 1,551 cara and 256 coaches/mini-vans. Bursa lacks its own railway station which means that the city isn’t very well connected to the rest of Turkey, and thus if you are planning a visit you will probably have to catch a bus. Once you’ve arrived in Bursa you will find that the metro system is actually pretty decent. This is the nearest metro station to Timsah Arena. Some local fans are campaigning for it to be renamed in honour of the stadium. Unless the Timsah Arena’ receives it own purpose built one, it would appear that Acemler is the closest metro station to the stadium. Located less than two minutes walk north-east of Bursapor’s stadium, Acemler station is served by Bursaray trains which is the city’s rapid transport system. Yenişehir Airport situated just over a 50 minute drive east of Bursais the closest Turkish airport, however there are very few international flights which means that you will likely have to transfer from Istanbul Ataturk Airport. Ground transportation upon landing at Yenişehir isn’t great. To the west of the stadium lies a business park and thus there are a handful of hotels such as the Crowne Plaza, The Sheraton, and the Gold Majesty Hotel. Back towards the historic centre of Bursa you will also find plenty of options particularly around the Sirameşeler and Şehreküstü metro stations.